Ahead of a formal announcement later today, the Chicago Tribune has confirmed that Elon Musk’s The Boring Company has been chosen to dig a high-speed train route from Chicago‘s Loop to O’Hare International Airport. 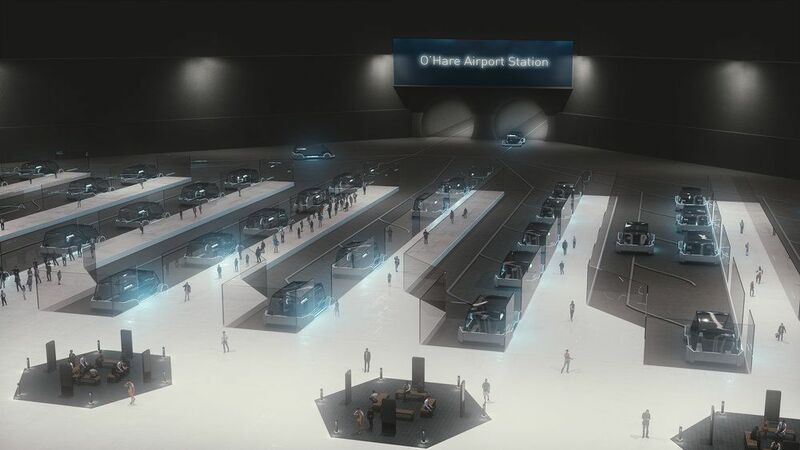 Mayor Rahm Emanuel’s administration has selected Musk to build out an underground rail system from Block 37 in the Loop to O’Hare, potentially cutting the transit time from an hour by car or 40 minutes on the Blue Line down to 12 minutes each way. The route is part of the recently announced $8.5 billion O’Hare rehabilitation. Under Musk’s proposal, The Boring Company would dig two tunnels along an as-of-yet undetermined route under the city, and transport passengers in autonomously-driven pods that would “skate” on electrified rails. Each pod would carry up to 16 passengers, and Musk has promised that pods would leave each station every 30 seconds. The promotional video for the proposal seems nearly identical to the one Musk previewed in March for traveling to the LAX, except with different station names. While no timeline has been proposed yet, the Tribune reports that unnamed sources have cited the potential cost as under $1 billion. The Boring Company will be paying for the project out of pocket using revenue from advertisements, the $20 to $25 ticket costs, and selling merchandise on the trip itself. Boring will also fund the construction of a new station at O’Hare and finish the scuttled Block 37 station, and ownership of the tunnels themselves is currently an open question. Boring has pitched the system as being buried 30 to 60 feet underground with 12-foot-wide tunnels, but there are still serious feasibility hurdles that will need to be cleared before the project gets the go-ahead. The route still needs to be approved by Chicago’s City Council, and Boring technically hasn’t completed any full-scale route yet. While the company is building out a similar network of tunnels in L.A. and has received an exploratory permit for their D.C. to NYC hyperloop, the autonomous pods being proposed haven’t been tested in real-world conditions. Another concern is capacity; a 16-person pod stopping every 30 seconds means that the system would run at a capacity of about 1,900 passengers per hour. For comparison, the Blue Line, which Boring’s link is meant to compliment, likely handles twice as much hourly traffic for $5 each way.